International Journal of Research in Health Sciences,2013,1,3,199-203. 1- Associate Professor, 2- M.Sc (Microbiology), 3- Professor & HOD, Dept of Microbiology, Chettinad Hospital & Research Institute, Kelambakkam, Kanjipuram District, Tamil Nadu, INDIA. Background: Chronic suppurative otitis media (CSOM) is a persistent disease of middle ear, which is capable of causing severe destructive sequelae with the manifestation of deafness, discharge and a permanent perforation. Early, specific and effective treatment can ensure prompt clinical recovery and prevention of possible complications. Aim: To study the aerobic bacterial and fungal etiology of CSOM and to also analyze the antibiogram of aerobic bacterial isolates from cases of chronic suppurative otitis media. Materials & Methods: One hundred patients with CSOM were prospectively studied. Two swabs were collected from each patient and cultured for bacteria and fungus. Standard method for isolation and identification of bacteria and fungus were followed. Antibiotic susceptibility testing was done by Kirby-Bauer’s disc diffusion method. Results: Out of the 100 samples studied for bacterial and fungal isolates, 83 samples yielded growth of potential pathogens, 10 samples did not yield any growth at all. The most predominant organism was Pseudomonas aeruginosa (60%) followed by Klebsiella (16%) and among fungal isolates the Aspergillus sps accounted for 50% of isolates. 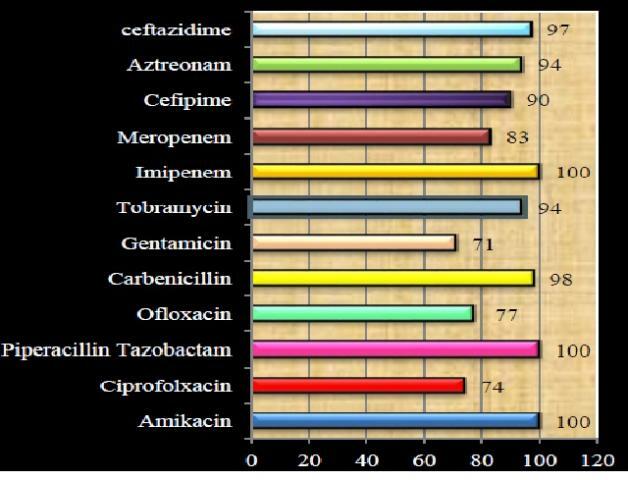 Pseudomonas aeruginosa and other Gram negative bacilli were most sensitive to amikacin and piperacillin-tazobactam. Conclusion: The study reveals that in a tertiary care hospital situated in the outskirts of Chennai the commonest etiological agent is Pseudomonas aeruginosa and isolates seems to be most susceptible to amikacin, ceftazidime and piperacillin- tazobactam.